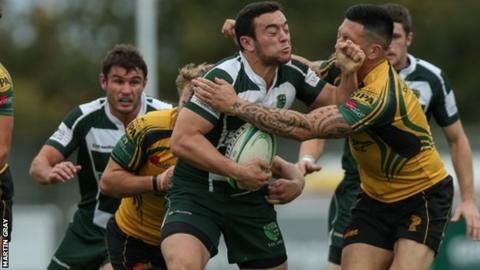 Guernsey director of rugby Jordan Reynolds says his side will not be fazed by the task of trying to stay in National Three London & South East. Reynolds' side are one point adrift at the bottom, and travel to third-placed London Irish Wild Geese on Saturday. "A couple of years ago we were bottom of the league at this stage and ended up eighth," Reynolds said. "We're not a panicking side. We're pretty confident we can pick up a win this weekend." He told BBC Guernsey: "How many teams that are bottom of the ladder can say that when you are playing against a top-four side? "We have nothing to shy away from, we know we have some talented players. We have done this twice already now, we know we can come out guns blazing." Guernsey, who have won only twice this season, for fielding an suspended player, and Reynolds knows the importance of regaining those points quickly. "It is quite vital for us to pick up these two wins to get off the bottom or the middle pack will get away from us," he added. "The potential is here, we are a lot stronger side this year."